Thomas Hurt [Hart] received a warrant and subsequently received two additional grants bringing his total acreage to 498 (1, p. 155) (3, p. 62). Circa 1675  Hurt only held the property for a short period of time. He divided the property into two, selling one section to Thomas Stanyarne and the larger portion to Edmund Gibbon (1, p. 155). Circa 1685  Edmund Gibbon died and left his land in South Carolina to his brother Francis Gibbon (1, p. 155). 1693  Gibbon conveyed the 370-acre parcel to William Hawett (1, p. 155). 1721  Arthur and Mary Foster owned the plantation (1, p. 155).
?  Charles Burnham was the next owner (1, p. 155). Circa 1750s  James Wright acquired the plantation. He increased the size of it to 508 acres when he was able to add back the original portion that had been sold c. 1675 plus an additional 10 acres of marshland (1, p. 156). Circa 1758  Wright conveyed the property to Samuel Brailsford (1, p. 156). Circa 1763  Henry Middleton purchased the plantation from Samuel Brailsford (1, p. 156). 1765  Middleton added a few more acres of marshland to the tract and sold the plantation to Sir Edgerton [Egerton] Leigh. Leigh was the colony's Powder Receiver and is thought to have been the one who constructed a brick building at the plantation that has been called the "Dead House." 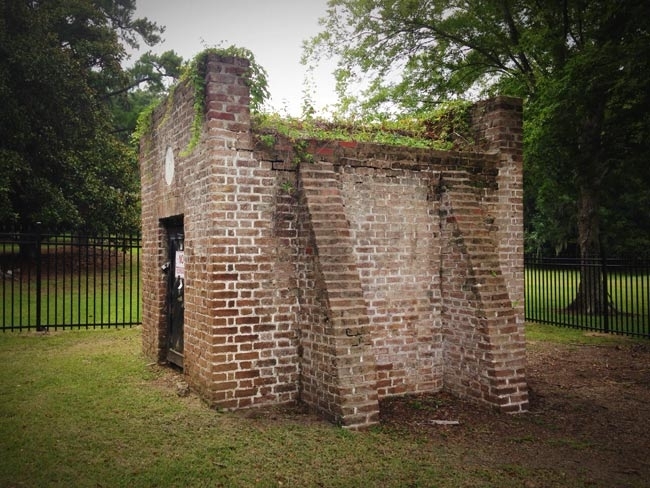 This moniker likely arose from the misbelief that the structure had once been a private mausoleum when it was most probably constructed for use as a powder magazine (1, p. 156) (6). Leigh's ownership also coincided with the first mention of a residence on the property. The house was of brick construction (3, p. 62). Circa 1775  Leigh sold the property to Thomas Laughton Smith. Smith enjoyed throwing parties at the plantation, but sadly, the house caught fire and was left in ruin. For many years, it was called the "Burnt House" (1, p. 156) (3, p. 62). 1778  Samuel Prioleau purchased the plantation from Smith. Prioleau greatly developed the plantation (1, p. 156). 1784  A plat of this year is the first documentation of the plantation being called Retreat (3, p. 62). Early 1790s  Edward Hare owned Retreat Plantation for a short period of time (1, p. 156). 1796  Hare sold Retreat to James Strachan and James McKenzie. It contained 389 acres at the time of this transaction (1, p. 156). 1798  James Lee purchased the plantation and shortly thereafter divided and sold off sections. 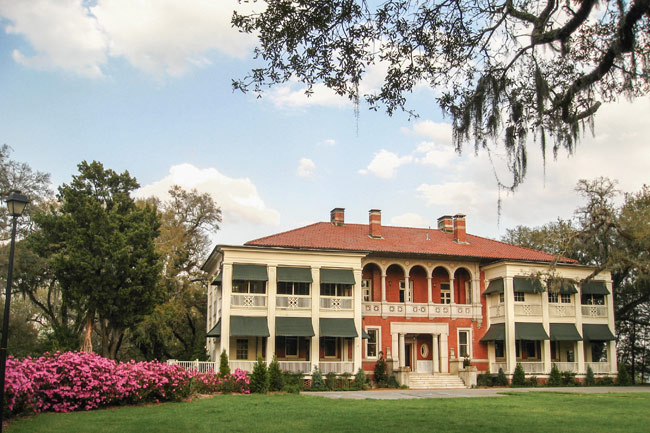 Theodore Gaillard bought an 82-acre southern piece of the plantation and called it Mons Repos. Thomas Hunt also purchased a section with Charles Wilson Glover buying the rest of the property (1, p. 156) (3, p. 161). 1803  Charles Wilson Glover's purchase of 263 acres was referred to as Happy Retreat (1, p. 157). 1851  Andrew Turnbull purchased Retreat Plantation. He soon built a grand home, known as Turnbull Mansion, and lived there for many years (1, p. 157) (4, p. 39).
?  William Chisolm acquired the plantation (5). 1895  The City of Charleston purchased Retreat Plantation from William Chisolm and developed Chicora Park on it (1, p. 157) (5). 1901  The United States Government purchased the property from the City of Charleston. Neighboring Marshlands Plantation was also acquired and developed into a navy yard (1, p. 157).